So after some feedback, I should probably explain this a little more. I think a lot about the content I output (see my recent blog post for an idea of how much time I spend thinking about this stuff). One of the big questions I’m always trying to answer is “What kind of webcomic is Socks and Puppets?” A friend recently added the comic to Piperka, and wanted me to give some keywords to explain what my comic was about. I had no idea. I suppose, the comic is mostly about making bad jokes and bad puns especially. But it’s not always that, and sometimes I like to use it for other things. Even with an idea of what my comic is about, there’s still a question of how I tell my jokes. I’ve a big bunch of characters that I use regularly and while they all have names and personalities and stories in my head, those don’t really come out in the comic. For example, the left of these two characters are “Caramel”, a human rogue who is quiet and unassuming, and tends to be good at listening to others. She’s also a kleptomaniac (as all good rogues are) – but has a discerning eye and tends to put effort into her heists. None of this has ever seen the comic. The right of these two characters is “Ocarina Von Harpsichord” – who is a Halfling Bard, who excels at understanding narrative causality, and is far more intelligent than she has any right to be. She has a magic rapier concealed in her hair ribbon, but rarely fights, instead using her knowledge of the situation to prepare her friends to do the work for her. All of this has been shown in the comic, but I bet nobody reading this remembers. My characters show up once every couple of months at best, and the content for each is so sparse that it’s hard to remember who they are, let alone what they’re like. But this isn’t a problem, because I’m not telling stories with them. My characters exist to occupy a specific simple function. They offer a quick visual trope that establishes a setting for a joke (fantasy, science, pirates etc) – and the characters themselves are not too relevant, even if they are self-consistent. So, It’s difficult to write character-driven humour, but easy to establish tropes. This restricts my humour pool a little, and I worry about it. On the flipside, the characters of myself and Joey that appear regularly are established enough that most people who read regularly will peg me as the joker, and Joey as the foil. If I have a modern day setting to tell a joke in, I’ll default to “us comics” because I have an established character dynamic. This means that Joey and I show up a lot. So, I’m worried about the direction my comic is going. 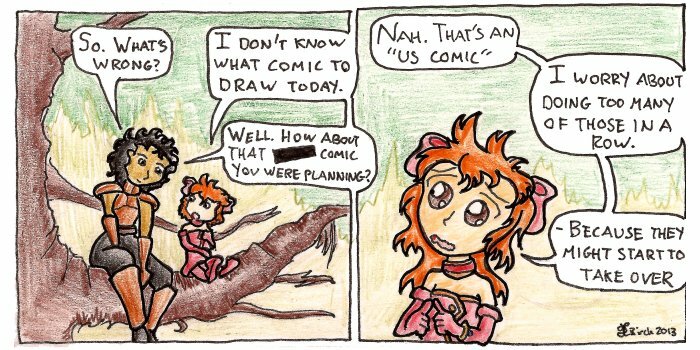 Every time I tell a comic using me and Joey, I come one step closer to falling into the world of diary comics, and that’s somewhere I don’t want to be. There are way too many comics about the lives of the author, and many of them are excellent. I can’t compete with Ty Halley for example. To avoid this fate, I try to vary the characters and scenarios I use in the comics to ensure variety. The randomness of characters used should synergise with the randomness of my content to create something closer to Buttersafe or xkcd. So what’s the joke today? The premise is that I’m worried about doing too many “Dave and Joey” comics, because it risks pulling my comic into a genre that I don’t want to explore. The joke in the strip is that the solution I propose to avoid this is to simply pallet swap my characters and hope nobody notices. The humour (to me) is that this is an abysmal method of fixing the problem, whereas the solution would be just to draw more comics with the other characters. So yeah, that’s the joke today.